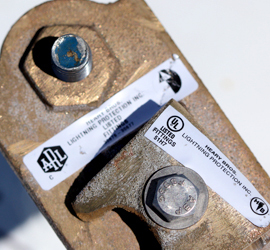 Florida Lightning Protection is a division of Windemuller Technical Services – a Sarasota, FL based company founded in 1985. You can count on us to provide skilled design and installation services and the appropriate products to protect your home. Preventor installations offer lightning protection for homes, buildings, industrial sites, monuments, or open-air sites such as sports stadiums. Each year thousands of ESE systems are installed on structures in the United States. What are the Standards for Lightning Protection Products and Services? As a State of Florida Certified Electrical Contractor, we comply with all applicable state and local building and electrical codes and standards for design, installation and testing. As a UL Listed Lightning Protection Contractor, our organization has been evaluated by UL and found to comply with UL’s lightning protection system installers program requirements. 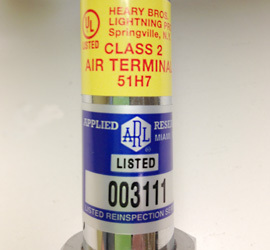 ARL – Applied Research Laboratories – evaluates the design and installation of lightning protection systems for compliance to NFPA 780, Standard for the Installation of Lightning Protection Systems or HBP-21, Manufacturer’s Installation Standard for Lightning Protection Systems Using Early Streamer Emission (ESE) Air Terminals. Applied Research Laboratories (ARL) is a full service internationally accredited testing laboratory. They provide product safety testing for compliance to recognize standards including field evaluations and performance testing for a wide variety of consumer products along with Listing, Labeling and Follow-Up Services. ARL is independent of any government or manufacturing organization and has been engaged in consumer safety testing for over 60 years. UL Listed and Certified. The lightning conductors, air terminals and fittings we utilize are also UL listed and certified. Contact us now for assistance in the design and installation of a cost effective lightning and surge protection plan for your Florida home.